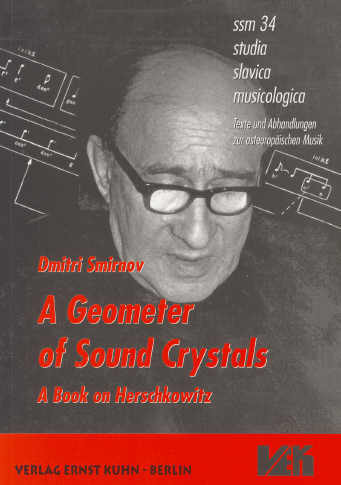 A Geometer of Sound Crystals is a complex book, as unusual as its title; one which will be read, and used, differently by each of its readers. It is a source book about a composer/musicologist who spent the greater part of his professional life in Moscow, of whom Gerard McBurney wrote " Gradually I began to form some impression of how important this Jewish Romanian pupil of Webern was in the hidden musical life of Moscow, our 'real life' as Sofia Gubaidulina has called it ". It is also a very personal memoir of an extraordinary and idiosyncratic musician and teacher by a younger composer and music theorist, Dmitri Smirnov. Phillipp Moiseyevich Herschkowitz, with whom Smirnov and his composer wife Elena Firsova built a close relationship during the years before they brought their family out of the Soviet Republic to England, had studied with both Berg and Webern. Smirnov's account centres upon the record of a series of lessons and conversations with Herschkowitz. Those were interrupted for ten years because of the Smirnovs' lack of money and subsequently resumed gratis " as I did not pay Webern; I want to give his lessons back ". Six early lessons, begun in 1970, were highly didactic analyses of Beethoven, especially his piano sonatas, and other Great Masters; Phillipp Moiseyevich Herschkowitz having made clear that he did not teach composition. These are dense, and fully illustrated dissections of individual movements which constitute the core of the book, and reflect what Herschkowitz might best wish to be remembered for. Smirnov makes the cogent point that in Britain " the teaching of musical form and analysis is "at a very superficial or amateurish level - - basic terms of music, such as "period", "sentence" or "theme" are practically eliminated - - ". These lessons and conversations, meticulously summarised and recalled in detail by Smirnov, need the close attention of a musicologist, ideally a Beethoven specialist, to do them justice, and they are clearly deserving of such attention*. For the ordinary untrained reader, a huge stumbling block to following the arguments into the experience of listening to the music is that most of us lack perfect pitch, or even a capacity to appreciate key relationships aurally to ponder, for example, why a passage comes in the subdominant instead of the mediant - - - . Many of the problems which exercise Herschkowitz have completely passed me by when enjoying playing and listening to Beethoven's music, but of those which he addressed had also puzzled me, and his solution to it will give readers the flavour of his didactic approach. I too had often wondered why Beethoven in his Seventh Symphony repeats the Trio and Scherzo twice each without any change? (And wished he hadn't!) Herschkowitz explains that if a question is about an abnormality " it is necessary to search for another abnormality. There is a 'mistake' in the Scherzo itself - in bar 44 a cadence on the dominant of C major instead of F major. After composing a 'wrong' Scherzo Beethoven had to repeat it again and again: Trio then Scherzo, and then Trio, and then Scherzo again - pretending as if he doesn't know what to do next ." Paradox features often in Herschkowitz's pronouncements and in ordinary conversation, and is a strand which holds the attention of the ordinary reader, as is also his 'wicked sense of humour', which enlivens many a discussion with outrageous and memorable sallies of wit. Unfortunately, he was not equally receptive to humour from others, and Smirnov recounts how his riposte " Don't you think that perhaps you value yourself too high? " to Herschkowitz's claim that " my idea about the third movement of Mahler's First Symphony is even more genius than the symphony itself " caused a resentment that festered until after the last meeting between them. Herschkowitz's chief heroes were Beethoven and Webern, and he can be dismissive of many a revered composer of the recognised canon of the Great. For example, he removed Brahms, Haydn and Berg from his list of Masters and explains why, not fully convincing his pupil and author of this memoir, Dmitri Smirnov. In a discussion of bad music by his greatest classical hero, he includes the Diabelli Variations - " if works are bad, it is wrong to play them." Of the symphonies, Herschkowitz told Smirnov "we have to speak of only six", in "macro cycles 3, 4, 5 and 6, 7, 8". Smirnov demurred that he still likes Nos. 1 & 9. (It's unclear what either of them had against No.2?) He answered "Dima, you are a good fellow, but you have one fault - - you live too happily"! Likewise, Webern's works without opus numbers "found somewhere in a loft - why do they play them?!!!" Clearly Herschkowitz would have had no empathy for today's dedication to ever more complete intégrales, including recordings of preparatory versions of established masterworks. Homework was set and led on to further topics, and the lessons and conversations which took place in the Smirnov/Firsova home, and in Herschovitz's, are described in full remembered detail, augmented posthumously with extracts from the teacher's writings (mostly published in Russian). Smirnov's account is intertwined with details from their personal lives which impinged upon the relationship. Smirnov acquired scores for Herschkowitz, who was not renowned for returning loans promptly, and helped him in the bizarre episode of the demise of Herschkowitz's cat, which left him distraught. Smirnov was enlisted for the funeral and for his teacher/friend dug the grave in frozen soil! We learn about the births of Dmitri & Elena's children, Philip and Alissa Firsova, about their first visit to London to be featured at the Almeida Festival (of which I was a habitué, and where I first become aware of these gifted composers who in due course settled amongst us). Herschkowitz's relative disinterest in their offspring was explained when he declared that he would not be able to visit them again for several years because of 'baby phobia'! Smirnov candidly prints a harsh response in 1986 to his own cantata, criticised for the similarly slow tempi throughout and slavish dependence upon the text, which was "processed with the sand paper of your singer's high register". The underlying theme was a warning to distrust one's 'talent', a pejorative word in Herschkowitz's critical vocabulary. So, it is a book which is fascinating on various levels, and of enduring value for making available in English the flavour of the sayings and writings of this substantial and unique figure, who spent the central part of his professional life (1940-87) in Moscow, suffering the privations of the time. He felt that his own music until played 'did not exist'. In Smirnov's view Herschkowitz is a significant, largely unpublished and unplayed composer, but his legacy is more likely to command attention in his voluminous theoretical writings. Smirnov analyses several of Herschkowitz's compositions and hopes they will eventually find 'dedicated performers and appreciative listeners'. The chances that this may happen are perhaps greater now than ever before, with record companies trawling libraries in search of novelties for premiere recordings - a tendency that Herschkowitz, with his severe views on music unworthy to be played, might himself deplore! A Geometer of Sound Crystals is a well produced academic publication, with lavish provision of musical examples and a comprehensive index (there are some page 'slippages', and photos promised in the preface do not appear). The appendix lists Herschkowitz's works and writings, with bibliography, biographical chronology and details of three rare performances of his compositions. *If a musicologist whose interest is whetted by this introductory review might volunteer, I should be glad to make my copy of this rare volume available, and to publish a further article in Musical Pointers - perhaps an analysis of Herschkowitz's lessons on the structures and harmonic relationships in Beethoven's piano sonatas, which Herschkowitz revered above all else?